Silicosis is a lung disease that develops when someone breathes in silica, which is a mineral found in sand, rock, and quartz. It typically affects people who work in mining, glass manufacturing, and foundries. Over a period of years, the silica scars the lungs and harms a worker's breathing abilities. At Pulgini & Norton, our Boston workers’ compensation lawyers can help people who are suffering from job-related silicosis. Silicosis symptoms may happen within a few weeks of exposure or after many years of exposure to silica. Early symptoms include a cough. When the silicosis is acute, a worker may suffer from sharp chest pains, fevers, and difficulty breathing. When the silicosis is chronic, there may be an abnormal chest X-ray that later develops into coughing and breathing difficulties. 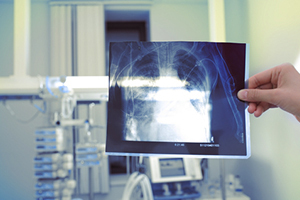 Sometimes a worker may mistake early signs of silicosis for bronchitis. Over time, as scarring progresses, the worker may have swollen legs, an increased breathing rate, and a blue discoloration of the lips. Since the main risk factor is exposure to silica dust, it may be prevented by limiting exposure, and there are national guidelines about exposure limits. However, limiting exposure is not an option for many workers. Your employer has a legal obligation to provide you with appropriate clothing and equipment to protect you from exposure. Workers should also protect their families by taking appropriate measures before going home and by getting medical examinations every three years. You may recover workers' compensation benefits for job-related medical conditions like silicosis. Workers' compensation is provided without regard to fault. It does not matter if the employer was at fault for not providing you with the proper equipment, and it also does not matter if you were at fault for not using the equipment and other measures that may have been provided to you. However, it may be challenging, in some cases, to recover the benefits that you may desperately need. In some cases, insurers may deny benefits while claiming that disabling symptoms of conditions like silicosis resulted from pre-existing conditions or conditions acquired later that were not related to work. For example, you might have both legionnaire's disease and silicosis. However, the existence of a pre-existing or after-acquired condition does not mean that you cannot recover workers' compensation benefits. A Massachusetts employer must accept you as you are, and you do not lose benefits because of a pre-existing condition or prior injury. As long as occupational silicosis is a major cause of your disability, your employer's insurer must pay you the benefits to which you are entitled. If your spouse or parent died due to job-related silicosis, you may be able to obtain survivors' benefits. You must file a claim within four years of their death. It may be devastating to get a diagnosis of silicosis. Many miners and foundry workers do not have the ability to work in other occupations, and silicosis may progress to respiratory failure and death. If you suffer from job-related silicosis, the Boston workers' compensation attorneys at Pulgini & Norton may be able to help you obtain benefits. We advise and represent clients in Cambridge, New Bedford, and Braintree, as well as other Massachusetts communities. For a free consultation with a job injury attorney, contact us online or call us at 781-843-2200.